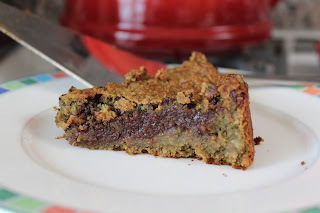 OK I know you're all thinking healthy chocolate chip pie how is that possible? All I can say is, it is, and it's delicious. I wish I could take full credit for this recipe, but I found it in one of my favorite blogs Chocolate Covered Katie. I changed the original recipe a little bit by adding kale and avocado, and not using oil. You can find the original recipe here. This recipe is gluten free, vegan and delicious. This would make a really delicious birthday cake or treat for little ones 12+ months. Preheat oven to 350F. Put all ingredients (except chocolate chips) in a large food processor and blend until smooth. Add chocolate chips and stir. Spray a deep pie dish with cooking spray. Pour batter into pie dish and bake for 45-50 minutes. The outside should be golden and crisp, while the inside should be like a fudge texture. Let cool for 5 to 10 minutes and enjoy!